If you are a gardener you know how dirty, dry and cut your hands can get even if you are wearing gloves! And admit it, don’t you often prefer sinking your hands into the earth during planting season? 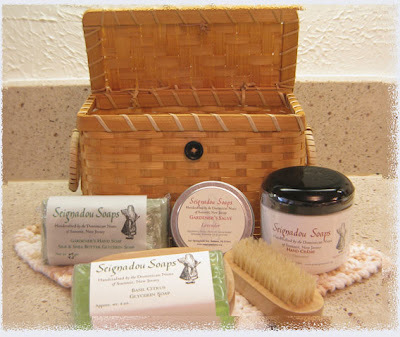 We think you will love this delightful little basket full to the top of Seignadou Soap products that will delight every gardener you know! The baskets, which have a top that keeps shut with a loop and button are perfect for keeping seed packages, string, row markers, etc. Find out more about the Gardener’s Basket HERE! Don’t forget: Apple Harvest, Bay Rum and Eucalyptus AND Pink Grapefruit. On Clearance! 15% off until gone!